Japanese Episode DP 159: "Roaring Ice Punch! Buoysel vs. Barriered!!" American Episode 1302: "Short and to the Punch!" Satoshi is working on getting his Fukamaru to master Meteoric Swarm. 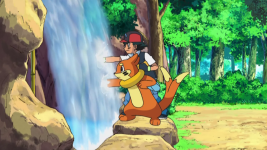 The land shark pokemon falls into a nearby river during its training, so Satoshi sends Buoysel out to rescue it. After the rescue, a martial artist named Kijuurou appears before everyone! Kijuurou was moved by Buoysel's heroics and decides that it has what it takes to take on his Barriered. Satoshi accepts his request for a battle, and before long their match begins. Unfortunately, Buoysel is unable to connect with any of its attacks and is defeated when Barriered unleashes a powerful Thunder Punch attack. Regardless, Kijuurou becomes impressed with Buoysel's guts and offers to train it to learn how to use Ice Punch. At first, it doesn't seem like Satoshi's pokemon is able to grasp the basics of what Kijuurou's teaching, but a breakthrough is made when a small crystal of ice is created by one of its punches. Buoysel's training continues through the night as Satoshi releases leaves to help Buoysel learn how to focus its concentration. A rematch is held, and at first the battle doesn't seem to be too different from the one before. Once it starts to rain, however, Buoysel's Swift Swim ability kicks in and gives the pokemon a boost in speed. It uses this to dodge Barriered's attacks and deliver a powerful Ice Punch that knocks its opponent out. Buoysel wins the rematch and has learned how to use Ice Punch! After receiving a few congratulatory words from Kijuurou, Satoshi and the others continue on the road to Asatsuki Town. One of the things I find to be a bit infuriating about the way Satoshi is training Fukamaru is the fact that he's just doing the same thing over and over and over. "Fukamaru, use Meteoric Swarm!" "OK, that didn't work...now, Fukamaru, use Meteoric Swarm!" "Not this time, either? OK...Fukamaru, use Meteoric Swarm!" He never tries anything other than ordering the pokemon to use the attack over and over and over again. The way he trained Buoysel in this episode, however, was a lot better. Sure, the science behind the whole thing doesn't really work - moving your hand really fast actually makes it hotter, not colder - but that's beside the point. Satoshi worked with his pokemon to teach it a move, tried out different tactics and, eventually, got it to learn the attack. If he had shown this kind of dedication to his Fukamaru as he is to his Buoysel, the blank-faced shark thing would have mastered the attack well before now. I also like that we get one last Buoysel-centric episode before the series ends. Buoysel doesn't really have a lot of victories under its belt, so seeing it redeemed in this episode is quite satisfying. This episode also boasts a unique character-of-the-day (I love the part where he and Barriered jump off screen, all Superman-like) and some of the most gorgeous animation you can get in a show with this budget. The English version of this episode re-taught me the fact that Buoysel's name has a funky spelling in the games / TV show. I knew that, of course, but since I don't really play the English versions of the games anymore and don't watch the dub when I'm not working on this website, it sort of slipped my mind. Other than that, the English version's music is as disastrous as it always is, but that's no surprise. This episode introduced a live action music video for Dotchi ~ Nyo?, and it's...well...let's go with "interesting." Or "nightmare-inducing." Either one works. Kijuurou's tendency to shorten words is retained in the dub. All the abbreviations, more or less, keep the same meaning as they did in the original. (後じゃないとじゃない) We're no match against that Mr. Mime unless that dynamo runs outta gas! (おかむ) I would like seconds please! (やなじ) We're blasting off again! I like how ridiculous Kijuurou is with all this. I mean, what's the point of abbreviating clusters of words when you have to give long-winded explanations anyway? Does he not realize what the point of abbreviations are, anyway? I'm also baffled by some of the abbreviations used here. Why does yappari dame datta become BariMe? On the English side of things, Jessie's "UnEmptyTum" which sounds like her stomach is actually not empty, doesn't it? The kicker for me, however, is Clayton's "SecPlea," which sounds more like a form of sexual harrassment than a request for more food. In any case, any character that gives me a legitimate reason to post a link to British TV shows (thanks for the reminder, PDL!) gets a huge thumbs up from me. Clayton: "Of course! You want to train with me!" Ash: "Yeah, and I wanna train, too! So won't you please teach me everything you know, chancellor?" First of all, I'm pretty amused by Clayton's choice of words here. Of course Buizel wants to train with me. Who can blame it? I'm awesome. Secondly, why in the world does Ash call Clayton "chancellor" here? Has Ash's mind, after enduring years of hardships and travel, finally snapped? Does he suddenly believe Clayton to be the ruler of this non-descript forest they're currently in? And if so, what does that make Barriered? During Buoysel's training montage, the second opening theme to Pocket Monsters Advanced Generation, Challenger, is used as background music. The dub replaces it with instrumental music.